My host family is so nice. David is the father and he was in the New Zealand Navy for 23 years. Helen (or Rongonui) is the mother and she is of Maori descent. She speaks to her son, Rawiri, only in Maori and David speaks only in English so that he is bilingual. The Maori language was almost lost a few decades ago and the people here have done a really good job at reviving it. They opened a school here in Palmerston North that Rawiri goes to that is taught only in Maori. To go to this school, the student must have at least one parent that commits to speaking only Maori with their child, just like Helen is doing with Rawiri. I’m really excited to begin my Socializing in Maori class (except they call it a “paper” here) so that I can practice the language with them. They have a very nice house and they have two cats named Pongo (Maori for “black”) and Tika (Maori for “tiger”). And guess what, I have a cat named Tiger too! There is also another exchange student from China living here with me. Her name is Jenny and she is studying Air Traffic Control. I learned that New Zealand is known for their ice cream and I am very excited about this because I love ice cream. I tried some called “Jelly Tip” and it was delishhh-ous :) It had strawberry jelly in it with little chocolate flecks and we put chocolate sauce (Hershey’s syrup) on it. YUM. Of course, this was after our dinner of Schnitzel, a breaded thin beef, corn on the cob, which is so in season right now it’s amazing, and a fresh salad with everything grown right here in Palmy. 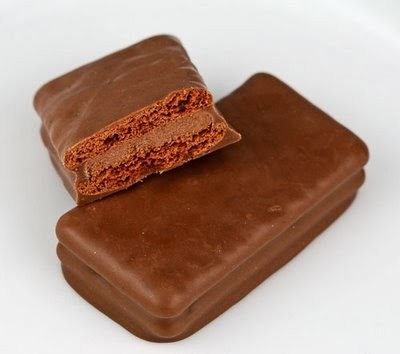 I also tried some really tasty chocolate cookies called Tim Tams. I asked, “where should I put my plate?” and Helen said, “just chuck it in the dishwasher”.